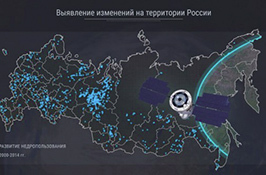 With the help of remote sensing data, TERRA TECH experts propose to analyze the socio-economic development of the regions of Russia, to monitor the dynamics of changes in the spheres of nature management, subsoil use, construction and ecology, the collection of land and property taxes and to solve other problems. Space survey is an objective and independent source of information and allows for reliable control of the activities of economic entities. The introduction of an integrated space monitoring system also contributes to the implementation of the objectives of the Digital economy programme.